I PURCHASED THIS ALUMINUM CHRISTMAS TREE AND COLOR WHEEL SEVERAL YEARS AT A SALE IN INDIANA WITH THE INTENTION OF ADDING THEM TO MY SOMEWHAT EXTENSIVE COLLECTION OF VINTAGE CHRISTMAS ITEMS! IT SEEMS THAT MY TIME IS IN RATHER SHORT SUPPLY DURING THE HOLIDAYS AND I JUST NEVER HAD THE TIME TO PUT A TREE IN EVERY ROOM AS I USED TO DO – BUMMER. THIS TREE IS ABSOLUTELY BEAUTIFUL AND IS SUPER HARD TO FIND IN THIS COLOR AND CONDITION. IT IS A PECO DELUXE TREE AND PER BOX IT IS GOLD COLOR. THE ALUMINUM IS ACTUALLY GOLD AND SILVER BUT PECO LABELED IT AS GOLD. WHEN ASSEMBLED, THE OVERALL APPEARANCE IS GOLD AS CAN BE SEEN IN OUR PHOTOS. THERE ARE 55 LIMBS THAT MEASURE 18” IN LENGTH. TREE HAS THE ORIGINAL BOX THAT IS IN VERY GOOD CONDITION AND THE PAPER SLEEVES FOR LIMB STORAGE. THE COLOR WHEEL IS A PENETRAY AND IS KNOWN AS THE “CADILLAC” OF COLOR WHEELS. IT IS GOLD COLOR METAL AND HAS 4 COLORED GLASS LENS. THE COLOR WHEEL WORKS GREAT BUT DOES HAVE THE PENETRAY TYPICAL ROTATION NOISE. IT DOES NOT HAVE ORIGINAL BOX. THIS IS A MOST COLLECTIBLE LISTING AND AS CAN BE SEEN IN PHOTOS, IT’S BEAUTIFUL! THIS LISTING HAS A 6 FT. ALUMINUM CHRISTMAS TREE AND A EVERLITE HOLLY LITE COLOR WHEEL! THE TREE WAS MADE BY STAR BAND COMPANY OF PORTSMOUTH, VIRGINIA AND THIS IS “THE SPARKLER” MODEL. IT HAS 55 LIMBS (AND 3 EXTRAS!) THAT MEASURE 20” IN LENGTH AND HAVE POM ENDS. TREE IS OUTSTANDING – HAS THE ORIGINAL BOX WITH STORAGE SLEEVES AND EVEN HAS THE ORIGINAL INSTRUCTION SHEET AND PARTS ORDER FORM STILL IN THE BOX! THE COLOR WHEEL IS A ROTARY COLOR PROJECTOR, EVERLITE, HOLLY LITE COLOR WHEEL. IT IS SOMEWHAT UNUSUAL AND RUNS GREAT! THIS IS SUCH A PRETTY TREE – SO SHINY! IT IS A PECO PINE TREE, 5 FT. 10 INCHES TALL WITH 46 LIMBS. IT HAS A 2 PIECE WOOD CENTER POLE THAT HAS LOST ITS ORIGINAL METAL “DOWEL”. PRIOR OWNER REPLACED WITH 2 STURDY WIRES THAT HOLD THE POLES TOGETHER AND THEY FIT SNUGLY. THE TREE HAS A TRI-POD TYPE BASE/STAND THAT YOU NEED TO REALLY “SNUG” THE LEGS ONTO/AGAINST THE TREE POLE SO THE POLE WON’T SLIP THROUGH TO THE FLOOR – DON’T KNOW WHY IT’S MADE THAT WAY BUT IT IS THE ORIGINAL STAND BASE FOR THIS TREE. TREE IS REALLY PRETTY AND WOULD BE AN IDEAL CANDIDATE FOR A TREE TURNER BASE – WOULD BE OUTSTANDING. THE COLOR WHEEL IS A HOLLY TIME AND IS SUPER QUIET. THE HOLLY TIME COLOR WHEELS HAVE THE ROTATION ARM LOCATED AT THE BOTTOM OF THE LAMP/HOUSING INSTEAD OF ON TOP LIKE PENETRAY WHEELS – I BELIEVE THAT ACCOUNTS FOR THEIR BEING QUIETER THAN OTHER WHEELS. TREE HAS ORIGINAL BOX AND SLEEVES FOR LIMB STORAGE. COLOR WHEEL DOES NOT HAVE ORIGINAL BOX. THIS LISTING HAS A 4 FT. PECO PINE STANDARD ALUMINUM CHRISTMAS TREE AND A COLOR MAGIC COLOR WHEEL! THE TREE HAS 31 LIMBS THAT MEASURE 17” IN LENGTH AND HAVE SMALL POM ENDS. THIS TREE ASSEMBLES A LITTLE DIFFERENTLY THAN OTHER PECO PINE TREES WE HAVE LISTED. THE POINTED/TAPER POLE PART GOES AT TOP WITH FLAT END POLE GOING INTO THE BASE. THE LIMBS FIT SNUGLY – THEY INSERT AT AN ANGLE ON TOP PART AND STRAIGHT IN ON BOTTOM PART. WHEN I ASSEMBLED THIS TREE, I HAD AN EXTRA LIMB SO THERE IS EITHER AN ACTUAL EXTRA OR I MISSED A SPOT – I LOOKED CLOSELY AND COULDN’T FIND A MISS BUT I DID NOTICE THAT THERE IS A HOLE WHERE THE TWO POLES GO TOGETHER BUT THE LIMB WOULDN’T STAY IN THERE. AT FIRST, I THOUGHT THESE CENTER POLES COULD BE A “MARRIAGE” BECAUSE ONE IS SMOOTH AND THE OTHER HAS A MORE ROUGH FINISH BUT THEY FIT TOGETHER AND THE TREE IS VERY PRETTY WHEN ASSEMBLED. SO I’M NOT CERTAIN. AT ANY RATE, IT’S A PRETTY TREE AND I’VE PRICED IT TO SELL. THE COLOR WHEEL IS A VINTAGE COLOR MAGIC MOTORIZED COLOR WHEEL, CHICAGO 47, ILL. I PURCHASED THIS WHEEL WITH THE TREE AND IT WAS IN ITS ORIGINAL BOX BUT THE BOX WAS SUPER DIRTY AND FALLING APART SO I PITCHED IT. THE COLOR WHEEL WORKS GREAT – HAS 4 MYLAR COLOR PANELS. THE MOTOR MAKES TYPICAL ROTATION SOUND (NOT AS LOUD AS PENETRAY WHEELS) JUST THE STANDARD ROTATION SOUND. TREE HAS ORIGINAL BOX AND PAPER SLEEVES FOR STORAGE OF THE TREE LIMBS. COLOR WHEEL DOES NOT HAVE ORIGINAL BOX. WOW – THIS IS AN OUTSTANDING LITTLE TREE AND COLOR WHEEL! THE ALUMINUM CHRISTMAS TREE WAS MADE BY EVERGLEAM ALUMINUM SPECIALTY CO. OF MANITOWOC, WI. IT HAS 58 BRANCHES THAT MEASURE 16” IN LENGTH AND THEY HAVE POM ENDS. IT HAS A 2 PIECE WOOD CENTER POLE AND A VERY STURDY TRI-POD TYPE BASE/STAND. COLOR WHEEL LOOKS NEW AND IT WORKS GREAT! IT IS A COLORTONE “JUNIOR” ROTO-WHEEL AND HAS THE GREEN COLOR HOUSING AND A ONE PIECE COLOR WHEEL THAT HAS 4 COLOR PANELS. TREE HAS THE ORIGINAL BOX THAT IS IN POOR CONDITION (MOSTLY HELD TOGETHER WITH TAPE BECAUSE THE BOX IS DRY AND FLAKING APART). IT DOES HAVE THE PAPER SLEEVES FOR THE TREE LIMBS. THE COLOR WHEEL HAS ITS ORIGINAL BOX THAT, LIKE THE COLOR WHEEL, LOOKS NEW! 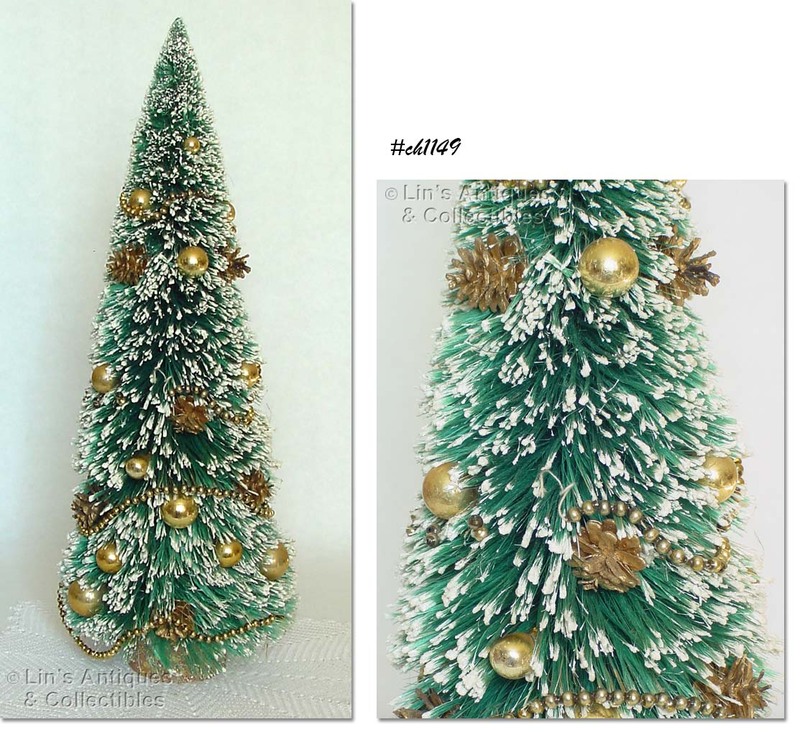 THIS LISTING HAS A BEAUTIFUL ALUMINUM CHRISTMAS TREE AND A HOLLY TIME COLOR WHEEL! THE TREE WAS MADE BY CONSOLIDATED NOVELTY COMPANY AND IS STYLE 7006. TREE HAS 45 LIMBS WITH POM ENDS AND MEASURE 22” IN LENGTH. THESE LIMBS HAVE THE MORE SLENDER WIRE. TREE HAS A 2 PIECE WOOD CENTER POLE AND TRI-POD TYPE BASE/STAND. THE COLOR WHEEL IS A HOLLY TIME COLOR WHEEL AND IS SUPER QUIET! THE COLOR PANELS ARE MORE LIGHTWEIGHT PLASTIC (AS COMPARED TO PENETRAY PANELS). THE RED PANEL HAS A TIGHT HAIRLINE AND THE GREEN PANEL HAS A CHIP ON AN OUTER CORNER – NEITHER OF THESE ARE DETRIMENTAL TO USE OR APPEARANCE AND I WOULD RATE THEM AS OF NO CONSEQUENCE. THE TREE HAS ITS ORIGINAL BOX AND PAPER STORAGE SLEEVES FOR 44 LIMBS (ONE SLEEVE IS MISSING BUT IS EASY TO REPLACE WITH BROWN WRAPPING PAPER). THE BOX IS IN VERY, VERY GOOD CONDITION. THE COLOR WHEEL ALSO HAS ITS ORIGINAL BOX THAT IS IN VERY, VERY GOOD CONDITION. VERY NICE TREE TURNER / STAND! THIS ONE WAS MADE BY HOLLY TIME, IS IN THE ORIGINAL BOX, AND WORKS GREAT. PER BOX, IT IS “FOR ALL ARTIFICIAL TREES UP TO 12 FEET HIGH AND 1 ½ INCH TRUNK”. TURNER HAS A COLOR WHEEL OUTLET. BOX SHOWS SOME STORAGE WEAR AND WRITING BY PRIOR OWNER BUT IS OVERALL IN ABOVE AVERAGE CONDITION. TURNER IS IN GREAT CONDITION. THIS IS THE OTHER MINT CONDITION VINTAGE CHRISTMAS FROM MY PERSONAL COLLECTION (THE OTHER ITEM IS A 6 ¾” SANTA, OUR INVENTORY #CH1413, LISTED IN ORNAMENTS). I PURCHASED BOTH ITEMS FROM A COLLECTOR APPROXIMATELY 10-15 YEARS AGO, WRAPPED THEM IN TISSUE PAPER AND STORED THEM – I HAVE NEVER DISPLAYED THEM AND THAT’S JUST NOT RIGHT, THEY’RE TOO CUTE TO BE STORED AWAY! THIS LISTING HAS A 9 ½” TALL SILVER FOIL TABLETOP/CENTERPIECE SIZE CHRISTMAS TREE WITH GLASS BEAD “ORNAMENTS” AND A SANTA FACE “TOPPER”. THE TREE CENTER POLE IS MADE OF WOOD, IT HAS A ROUND WOOD BASE, AND IS STILL STANDING ON THE ORIGINAL CANDY CONTAINER. SINCE IT HAS NEVER BEEN USED, THE CANDY CONTAINER HAS NOT BEEN OPENED SO IF YOU OPEN THE CONTAINER, PLEASE DISPOSE OF THE CANDY! THE LABEL INSIDE CANDY CONTAINER READS: PACKED BY GEORGE HIRSCH CO, HIALEAH, FLORIDA. THE ORIGINAL PRICE TAG ON THIS ITEM SHOWS IT WAS PURCHASED AT “KILPATRICK’S, OMAHA” AND IT COST $1.25 PLUS .03 TAX. THIS IS A NEAT ARTIFICIAL CHRISTMAS TREE! PRODUCED BY ALUMINUM SPECIALTY COMPANY, THE TREE IS 4 1/2 FEET TALL AND IS MADE OF POLYETHYLENE. TREE HAS A WOODEN CENTER POLE THAT’S COVERED WITH BROWN PAPER TO HAVE THE APPEARANCE OF TREE BARK. ALL LIMBS ARE PRESENT ALTHOUGH THERE ARE SOME LOOSE PIECES IN THE BOX. ASSEMBLY INSTRUCTION SHEET IS IN THE ORIGINAL BOX. TREE IS IN WONDERFUL CONDITION BUT I BELIEVE IT HAS BEEN STORED IN A BASEMENT AS IT HAS A SLIGHT MUSTY SMELL THAT MAY GO AWAY IF AIRED. THESE PLASTIC TREES ARE DIFFICULT TO FIND IN THIS SIZE! THIS IS AN ADORABLE TABLE/CENTERPIECE SIZE ALUMINUM TREE! IT’S 2 FEET TALL WITH WOODEN CENTER POLE AND ROUND WOODEN BASE AND IT HAS 17 LIMBS/BRANCHES WITH POM ENDS. TREE IS IN WONDERFUL CONDITION – THE ALUMINUM ON THE TOP LIMB IS SPLIT – VERY COMMON AND IS CAUSED BY USING A TREE TOPPER. IT DOES NOT HAVE THE ORIGINAL BOX BUT DOES HAVE THE PAPER SLEEVES FOR LIMB STORAGE. VERY PRETTY!! 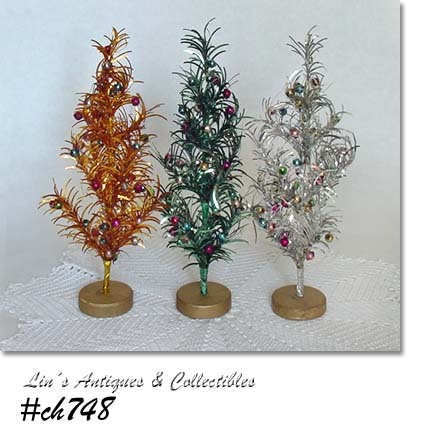 THIS IS A CUTE LITTLE TREASURE PINE ALUMINUM TREE! IT’S THE 2 FOOT TABLE TOP SIZE, HAS A WOODEN CENTER POLE AND BASE, HAS 13 STRAIGHT NEEDLE LIMBS WITH PAPER STORAGE SLEEVES, AND IS IN THE ORIGINAL BOX. THE LITTLE POM DECORATIONS ARE NOT ORIGINAL TO THE TREE BUT WERE IN THE BOX WHEN I PURCHASED SO I’M INCLUDING THEM – THERE ARE A TOTAL OF 10 BUT THE GLASS CENTERS ARE BROKEN IN 3 OF THEM. THIS IS A REALLY NEAT LITTLE BRUSH TREE! IT MEASURES 6” TALL, THE TREE IS WHITE AND HAS SO MUCH DECORATION THAT IT APPEARS TO BE GOLD COLOR – PLEASE SEE PHOTO. THE WOODEN BASE IS COVERED WITH RED FELT TRIMMED WITH GOLD GLITTER AND BOTTOM IS STAMPED JAPAN. THIS IS A FIND – IT’S A 22” TALL BRUSH TREE! IT’S DECORATED WITH GOLD GLASS BEAD GARLAND, GOLD GLASS ORNAMENTS (IN ASSORTED SIZES), AND PINECONES – IN ADDITION, THE TREE HAS “SNOW” ON IT. THE “POT” IS MADE OF WOOD, IS COVERED WITH GOLD GLITTER, AND STAMPED JAPAN. SUPER! I’VE HAD THESE LITTLE TREES IN GOLD AND IN SILVER BUT THIS IS THE FIRST BLUE AND SILVER TREE! 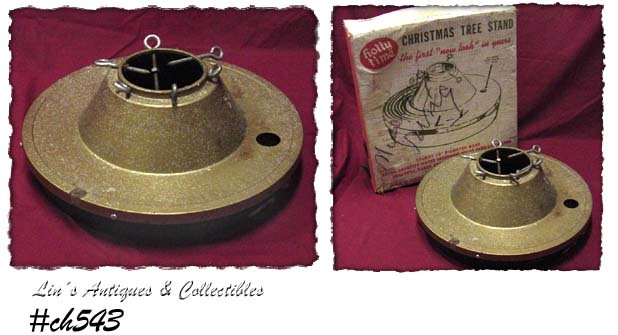 IT MEASURES 14 ¾” TALL, LIMBS HAVE SOFT TINSEL, AND THE TREE HAS A ROUND PLASTIC BASE. THERE ARE GLASS BEAD “DECORATIONS” ON LIMB TIPS AND THERE IS A PRETTY WHITE BELL AT TOP OF TREE. NEAT ITEM! SUPER NEAT BRUSH TREE! THIS IS A “ST. NICK” TREE, MEASURES 12 ¾” TALL, AND IS IN THE ORIGINAL BOX. TREE IS WHITE WITH SILVER GLITTER TIPS AND IT’S “DECORATED” WITH A GLASS BEAD GARLAND. GREAT ITEM! THIS IS A CUTE LITTLE TABLETOP ALUMINUM TREE! IT’S THE 2 FT. SIZE WITH WOOD CENTER POLE AND BASE, HAS 13 LIMBS (DOES NOT HAVE PAPER STORAGE SLEEVES), AND IS IN THE ORIGINAL BOX. THE SMALLER SIZE TREES ARE BECOMING DIFFICULT TO FIND – THIS ONE IS NEAT! NEAT TREES! THERE ARE 3 IN LISTING – GREEN, SILVER, AND A GOLD COLOR – AND EACH HAS ATTACHED MULTI-COLOR GLASS BEAD “ORNAMENTS”. MEASURE 8” TALL AND HAVE A GOLD COLOR WOOD DISC TYPE BASE THAT IS STAMPED JAPAN. THIS IS ONE OF THE NICEST 2 FOOT ALUMINUM TREES I’VE SEEN IN A WHILE! PRODUCED BY METAL TREES CORPORATION, CHICAGO 9, ILLINOIS AND IS STILL IN THE ORIGINAL BOX WITH PAPER SLEEVES FOR THE 13 LIMBS. THE ASSEMBLY AND STORAGE INSTRUCTION SHEET IS STILL IN THE BOX! BEAUTIFUL LITTLE TREE! THIS IS A CUTIE – A LITTLE 6 ½” BATTERY OPERATED CHRISTMAS TREE! LITTLE TREE IS DECORATED WITH 2 GOLD PAPER STARS, GLASS BEAD “ORNAMENTS”, GLASS BEAD WREATH “ORNAMENTS”, GOLD COLOR TINSEL GARLAND, A CHENILLE CANDY CANE, A GOLD COLOR PLASTIC BELL, AND LITTLE PLASTIC “CANDLES”. 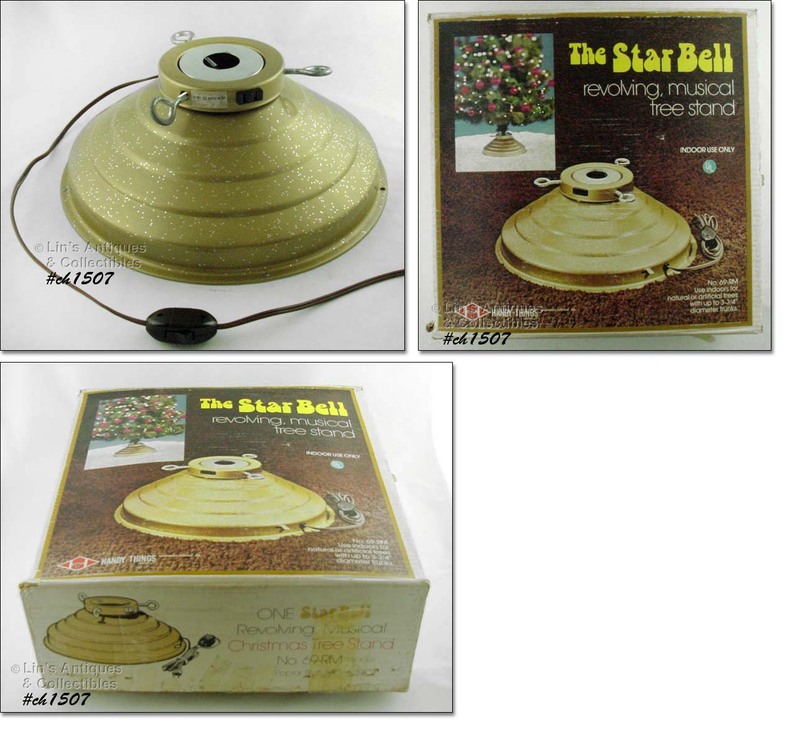 IT HAS A REMOVABLE GOLD COLOR PLASTIC STAR TOPPER THAT HAS BEEN DROPPED CAUSING A PART OF THE STAR TO BREAK ON ONE SIDE (NOT NOTICEABLE IF TURNED TO THE BACK). BATTERY HOUSING (TREE BASE) IS GOLD COLOR METAL AND HOLDS 2 “C” SIZE BATTERIES. PER THE BOX, THIS IS A BLINKING TREE BUT IT DIDN’T BLINK WHEN I HAD IT TURNED ON. HAS ORIGINAL BOX – SHOWS WEAR AND TOP FLAP IS MISSING. NEAT ITEM – DIFFICULT TO FIND! THIS IS A FIND -- A HOLLY TIME TREE STAND FOR USE WITH A LIVE TREE! PER BOX, THE FIRST "NEW LOOK" IN YEARS, AND "STURDY 18" DIAMETER BASE, EXTRA-CAPACITY WATER RESERVOIR HOLDS OVER 2 1/2 GALLONS, BEAUTIFUL BAKED ENAMEL FINISH". TOP OF STAND IS GOLD COLOR WITH GLITTER, BOTTOM IS BLACK. HAS A TOP WATER-FILL HOLE. IT'S IN VERY GOOD CONDITION, HAS SOME MINOR RUSTING. BOX IS IN GOOD CONDITION AND IT PROUDLY STATES "MADE IN AMERICA BY AMERICANS WITH AMERICAN MATERIAL". UNUSUAL FIND!